The Inquisitor's Tale by Adam Gidwitz is a middle grade novel which was awarded a 2017 Newbery honor. It is the story of a medieval inquisitor who arrives at a French inn seeking information about three children whom King Louis IX wants to arrest - Jeanne, a Christian peasant, William, a Christian oblate, and Jacob, a Jew - and the dog who accompanies them. Various individuals drinking at the inn volunteer bits and pieces of the story of how the three children have come to be traveling together, first to escape from different unfortunate circumstances that threaten their lives, and later to rescue copies of the Talmud from being burned by the king. Only after hearing the others' stories does the inquisitor make up his mind about what he must do. I try to make it a point to read children's novels with religious themes, not only because I like to find those rare gems that get it right, but also because I think someone should critique the books that get it wrong, especially when those books are critically acclaimed and recognized with awards. I had an open mind about The Inquisitor's Tale, and I honestly wanted to like it. I could tell early on, however, that this book was not going to be appropriate for my Catholic children, and that it would not be something I could recommend to other Catholic families. As a Catholic parent, I feel it is important for historical novels involving church history to incorporate accurate truths about the faith. In many respects, this book does not. Since I haven't found a review that points this out, I feel that the voice of a practicing Catholic would be a valuable addition to the collective discussion about the book. This review, which contains many spoilers, including details from the ending, is my critique of The Inquisitor's Tale from a Catholic perspective, with reference to key areas that I find particularly important in religious-themed fiction. THERE ARE MANY SPOILERS BEYOND THIS POINT. I want to begin with the concept of heresy. Though the Inquisition has been over for centuries, it is still possible to be a heretic. The Catechism of the Catholic Church defines heresy as "the obstinate post-baptismal denial of some truth which must be believed with divine and catholic faith, or it is likewise an obstinate doubt concerning the same." When raising Catholic children, parents are called to teach them the fullness of the truth, and I would consider it part of my duty to avoid teaching my children heresies, and to correct heretical ideas my children may develop either through misunderstanding or misinformation from outside sources. It is this misinformation that gives me pause when it comes to reviewing The Inquisitor's Tale. The primary heresy addressed by this book is the notion that a dog (Gwenforte, based on a real-life dog named Guinforte) can be a saint. Throughout this book, individuals who recognize this belief as heresy are shown to be enemies of the three children, and made to seem evil and foolish. When knights arrive in Jeanne's village looking for the dog, they are tricked into swimming in the dung heap. When the inquisitor's identity is finally revealed, he admits that he was planning to kill the three children, and that he only changed his mind because he came to believe they were not heretics, but saints. Based on these events, it would be easy for a young reader to conclude that there is no real reason to correct heretical beliefs, and that the only motives behind such a correction must be driven by evil. The fact remains, though, that it is still a heresy today to believe that a dog can be a saint. I teach religious education, and the question of animals and the afterlife comes up at least once a school year. During the discussion, no matter how young the kids, someone always voices an objection that begins with, "But in All Dogs Go to Heaven..." Kids are heavily influenced by all forms of media, and they are more inclined to believe what they see in a movie or read in a book than what I tell them in the 75 minutes I see them each week. A book like this, which does not separate the goodness of being spared death from the harm caused by believing in a heresy, is really confusing for a Catholic child whose faith is still in formation. There is nothing in this story, or in the author's note, to explain that, while it would have been wrong for the inquisitor to kill the children merely to prove himself to his superiors, the decision not to do so does not automatically make the children right about venerating a dog. It seems very unlikely that a child could walk away from this book with an understanding of what the church actually teaches, which is that animals have material souls, cannot make moral decisions, and therefore cannot go to heaven to live as saints. The question of whether a dog can be named a saint goes hand-in-hand with another problem I found in this book: the blurring of the lines between religion and fantasy. Religious faith often looks fantastical, especially to non-believers. So much of what Christians believe is unseen, and if you are not familiar with Christian teaching, an angel can seem as likely to exist as a unicorn. Including a religious figure like St. Michael the Archangel in a story where there is also a dragon can make it seem as though both are imaginary, and that belief in one is as silly as belief in the other. (There are many stories about saints tangling with dragons, but these are usually Satan in the form of a dragon, not an actual dragon creature like the one in this book.) Having St. Michael appear in human form (as Michelangelo, one of the children's guardians and friends) really bothered me. This is because, though he sounds made-up, St. Michael is real. When St. Michael, the character, states that he has spent time in heaven with Gwenforte, this is now a situation where a real Christian figure is speaking a heresy. His statement undermines the authority of church leaders in the book, as well as the teachings I am trying to pass down to my own children. I can recognize that an author has the freedom to use poetic license, but I can't get comfortable with the idea of my kids reading a story where one of the saints of the church furthers a common misunderstanding about the faith. "There are only two beings in Creation that I fear," he said. "One above, and one below. Strangely, when they walk the earth they both take the same form. Of a little old woman, with silvery hair, sparkling eyes, and a knowing smile." I really wanted there to be another interpretation, so I read and reread the passage several times, but it seems to me that Michelangelo must be referring to God and Satan. And if that is the case, then there are many problems with this explanation. First, while it is possible for an all-powerful God to appear in any form he chooses, there is no evidence that God has ever appeared in any human form other than that of Jesus Christ. There is certainly nothing to suggest he has ever appeared as a woman. Without a clear reason for this to be the case, this just reads like a weird feminist twist on theology, and I find that offensive. Equally offensive is the notion that either God or Satan might be a cheeky old nun drinking and swapping stories in an inn. This cutesy attempt to domesticate the two most powerful forces in the universe clinches for me that this is not a book for Catholic children. Rather, this is a book that seeks to update the world's oldest beliefs for a 21st century audience and reduce them to mere fantasy. The hint at the fact that the nun might be either God or Satan also suggests an equality between God, the creator who exists outside of time and space, and Satan, a fallen creature of God, which is misleading, and again, fundamentally incorrect. Ordinarily, a book that takes such liberties with reality would include a major debriefing at the end, but while the author's note addresses many things, an explicit mention of his treatment of Catholic teaching is notably absent. Another thing I dislike as a Catholic parent is moral relativism, the notion that what's true for one individual may not be true for the next, but that all these truths are equal. As a Catholic, I believe I have been given the truth by Jesus Christ and his church, and that this is the truth for everyone, whether they believe it or not. If I did not believe this was the one and only fundamental truth, I would not practice the Catholic religion, or any religion at all. So when I decide whether a children's book about Catholicism is appropriate for Catholic kids, I consider whether the story allows for the possibility that there is a fundamental truth. This book did not necessarily need to claim that Catholicism was definitely true, but for me to feel comfortable handing it to a Catholic child, it needed to avoid promoting a relativistic approach to religion and allow for the possibility that there is one true religion. Unfortunately, this book has two moments that seem to favor a morally relativistic point of view. One is minor. The three children decide to pray, and when one of them asks whether the prayer should be Jewish or Christian, they determine that it doesn't matter. This is not necessarily problematic, as it is true that Jews and Christians believe in the same God, and the prayer that follows is perfectly appropriate to both faiths. It only strikes me as a problem in retrospect, after reading another scene in the book. When the king offers a monetary reward to anyone who converts from Judaism to Christianity, Gidwitz writes: "Just a few days ago, William and Jeanne would have begged Jacob to follow Christ, and save his soul from damnation. Now the idea of it seemed ludicrous. If God would save their souls, surely, surely He would save Jacob's too. What difference was there between them, except the language in which he prayed?" I am not complaining that Jeanne and William no longer believe Jacob will automatically be damned, because I don't believe that myself, and the Catholic church does not teach this about Jews or about any other non-Christians. I provide those lines only for context. It is really the final question here that is the issue. And my answer is that there are many differences between Christianity and Judaism, and language is probably the least significant. It surprises me that, in a time when diverse children's books are meant to be celebrating differences, this book seems eager to reinforce the idea that differences don't matter, and that all religions (including Islam, the book not-so-subtly interjects) are essentially the same. This book seems to espouse a worldview that specific tenets held by specific faiths are stumbling blocks to acceptance and goodness, rather than stepping stones. Rather than accepting each other's religious differences to promote peaceful relationships, the characters seem to set them aside in order to achieve unity. I don't think any parent who is raising a religious child wants that child to compromise his beliefs in order to maintain a friendship; rather, parents want their kids to make friends who will accept them as they are, faith and all. Another major criticism of the treatment of religion in this book has to do with Chapter 23, which many have cited in their reviews for its depth and its poignancy. It is the scene when the three children begin to question why God allows suffering in the world, and they get into a discussion with a drunk friar who tries to explain it to them. His explanation talks a lot about the mystery surrounding God, and how we, who were not there at the beginning of time, have no way of knowing what God's true plan is. His advice is for the children to study God's earth as best they can so that they can understand a little bit when bad things happen. Then a minstrel chimes in to sing a song about a father and son who approach each other in battle, knowing that one will have to kill the other. The song ends without resolution, which bothers Jacob and William, but Jeanne finds the uncertainty beautiful. The minstrel then announces that God is a troubadour, who sees the beauty of the song he is writing because he is not in the song himself. The topic is closed after it is determined that tragedies are not beautiful, but that the song to which they belong still might be. This is all written very beautifully, and it is one of the passages that helps me understand why the Newbery committee selected it for an honor book. But a key component of Christian teaching about suffering is missing from the conversation. While I agree that God's plan is mysterious to us all, I was puzzled by the fact that a serious discussion of pain and tragedy did not mention the value of redemptive suffering or its ability to unite human beings with Christ on the cross. In fact, for a book with so many Christian characters, it doesn't say much about Jesus other than to make casual references to his birth in a manger, his ability to walk on water, and his admonishment to follow the Golden Rule. These basic facts really only skim the surface of the richness of Christian teaching and tradition, and this lack of depth, along with the lack of any real Catholic resources in the book's bibliography (beyond stories and legends about saints) result in an overall superficial treatment of Christianity by the text. Finally, I was irritated by the way this book makes it seem funny and cute to use God's name in vain. I would consider this a relatively minor issue on its own, especially since most of the swearing is true to the historical time period, but in this book, which is already so fraught with problems, it was just one more thing that set my teeth on edge. I am fine with using the language of the time period to add some color and depth to a story, but it seemed to me that phrases like "God's teeth" and "Jesus's boots" were placed in the story more for comic relief than atmosphere. I was also disappointed by the toilet humor. The most egregious example is the farting dragon, who is apparently taken from a medieval legend, but there are many mentions throughout the book of where people use the bathroom, and many of them seem gratuitous. (Even the knights searching for Jeanne in the dung heap, which does have bearing on the plot, seems unnecessary.) The toilet humor annoys me even more after seeing the author comment on Goodreads that a farting dragon should be all it takes to get kids to like this book. I feel that children's authors who write this kind of humor into their books send the wrong message to readers and demean the field of children's literature as a whole. Of course kids think this stuff is funny. It's up to adults to rise above it and teach them how to enjoy humor that doesn't rely on bad manners. 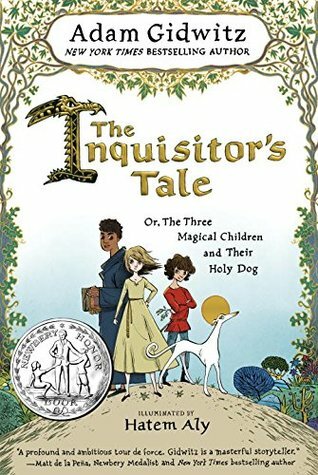 The Inquisitor's Tale has an engaging premise, an interesting (if not entirely original) Chaucer-esque format, and many surprising twists and turns. The writing is not consistently great, but there are definite transcendent moments, and as an adult, I was able to appreciate those while also being mindful of the flaws in the treatment of religion. Kids, however, are still in the process of forming their religious faith. Kids who are growing in their faith need books that illustrate the church's teachings in real-world contexts so they can see how Jesus's words from long ago still have meaning for them today. They do not need a book that plays with beliefs they are just beginning to understand, and that concludes, in the end, that it doesn't even matter which religion they practice. Were I not a religious person, I think I would be able to suspend my disbelief and perhaps enjoy the world of this story. As a religious person, however, the fantasy elements didn't ring true because they strayed too far from what I believe to be the truth. Thank you for your well-written, thoughtful essay. I am not a Christian, but I thought your review was the most interesting one on Goodreads. I appreciated hearing your carefully considered point of view. Thank you for this! As a faithful catholic trying to form 4 children (5yo-12yo), I very much appreciate your review! I'm going to hold off on this one for now. Thank you for your review! As a Catholic mother of young girls who want to read this I found it very helpful!